End-over-end industrial drum mixers provide the fastest and most effective method of mixing. The motion of the drum creates a lot of material roll-over which ensures contents in the bottom of the container combine well with the upper layer. Horizontal barrel rollers provide a gentler mix; it can take longer to mix this way as material is not moved as aggressively. Some sediment in the base of the drum may be hard to dissolve with a horizontal roller style mixer. 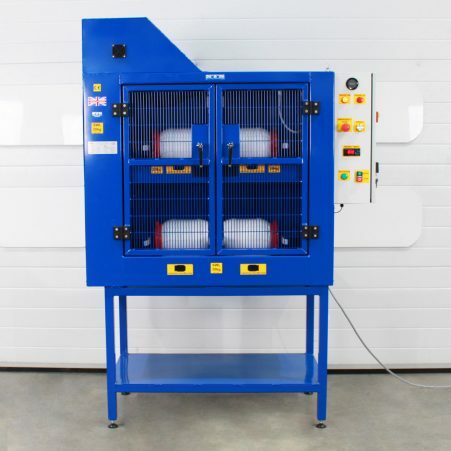 ATEX compliant pneumatic powered drum tumbler for 205-litre drums and barrels; an adapter is available for mixing shorter drums. This electric horizontal drum roller is ideal for mixing four drums simultaneously. A pneumatic ATEX option is also available.